You are here: Cambria > Obituaries > SHARP, Joseph C.
With all honors due him as a veteran of the Civil War, Joseph C. Sharp, who died early Sunday morning at Memorial Hospital, will be buried tomorrow. Public services will be held at the late residence of Mr. Sharp, 1398 Franklin street, Roxbury, beginning at 2 o'clock Wednesday afternoon. A sermon will be delivered by the Rev. P. L. Griffiths, pastor of the Derby-street United Evangelical Church, of which Mr. Sharp was a member. Post No. 30, Grand Army of the Republic with which Mr. Sharp was associated, will have charge of the burial, representatives acting as honorary pallbearers. 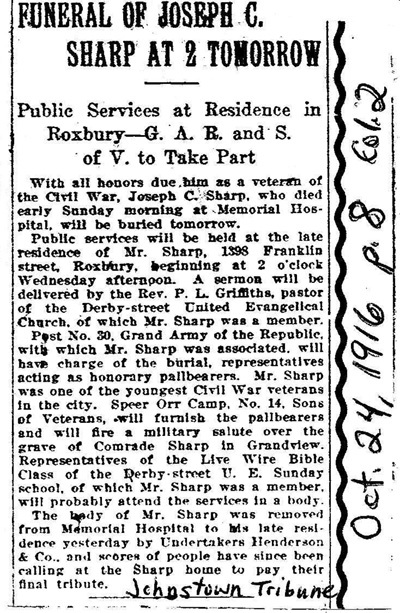 Mr. sharp was one of the youngest Civil War veterans in the city. Speer Orr Camp, No. 14, Sons of veterans, will furnish the pallbearers and will fire a military salute over the grave of Comrade Sharp in Grandview. Representatives of the Live Wire Bible Class of the Derby-street U. E. Sunday school, of which Mr. Sharp was a member, will probably attend the services in a body. The body of Mr. Sharp was removed from Memorial Hospital to his late residence yesterday by Undertakers Henderson & Co., and scores of people have since been calling at the Sharp home to pay their final tribute.